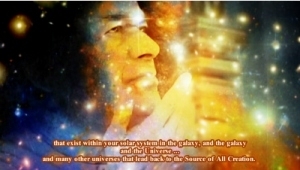 We called upon Cosmic Sai Baba with great love & respect to make his presence amongst us. ❝ I am here – I am very pleased to be here among you ladies that are so peaceful and harmonious. And I say this with great admiration … because as you have been saying – when you were talking – that this is something you would like to see upon this Earth – everywhere. We from the World of the Stars would also like to see this happen. And we are here … Do not forget! … We can help you to make the changes. … So please ask. The World at this time is actually (or appears to be) in total chaos – but not everywhere. It is not all over the Earth. However, there are many things, many challenges people are facing and I would like you to continue with your prayers and your assistance – so that – you so willingly give to your fellow humanity – I would like to say we commend you for that – and we are happy that we are able to help YOU when you call upon us. I want to reassure you that all is moving forward and good times are coming – a little time off yet. But they are very close. So take heart from that because the Universal Love and the new energy that is coming upon this Earth is starting to cover the whole of the Earth; and touching everybody upon this Earth, and they cannot help but change to match the energy … above … from the Creator of All. Remember that. … If you get a little bit disheartened – remember that. That is all that I ask of this day. I send my Blessings to all of you. And thank you! Thank you, thank you, for working so well with the heart that comes within all of you – of compassion. For this is what is needed at this time.